Upgrade a 1TB hard drive (HDD) to a 500GB solid state drive (SSD) is not an easy job. How to clone 1TB HDD to 500GB SSD for your Windows 10/8/7? 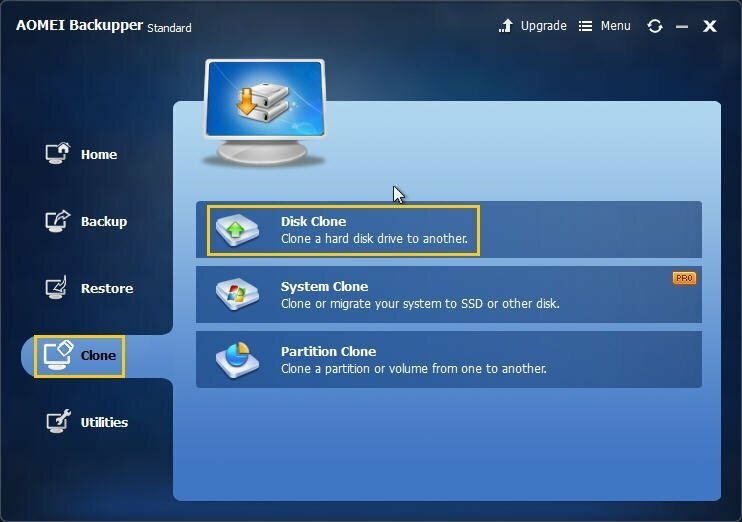 You will discover the free and easiest way to clone large HDD to smaller SSD without any issues via the best hard drive cloning software. I am planning to purchase a 500GB Samsung 850 EVO SSD drive to speed up my gaming computer. I have a 1TB hard drive used 200GB that I want to replace with. I’m wondering if the Samsung Migration Software is able to clone all my data onto my new Samsung 850 EVO SSD drive. Because I got a problem when cloning data from a 2TB hard drive to a 1TB drive with Windows 7 built-in utility. So how to clone my 1TB hard drive to a 500GB SSD drive without any issues? Why Do You Need to Clone Large HDD to Smaller SSD? In the view of the advantages of solid state drives, SSDs is much faster than its HDD equivalent on reading and writing; more durable than HDDs due to its special design no spinning parts. SSDs become more and more popular among computer hardware, many users would like to upgrade the current hard drive (HDD) to solid state drive (SSD) to get a better performance than ever. Load programs or games faster. Faster speed of reading and writing. How to Clone A 1TB HDD to A 500GB SSD without Reinstalling? Cloning larger drive to smaller drive includes many situations, like clone 1TB HDD to 500GB SSD, clone 1TB HDD to 250GB SSD, clone 1TB HDD to 256GB SSD, etc. In a word, cloning hard drive between different sizes is not an easy work. Besides, you will need the best hard drive cloning software to clone 1TB to 500GB SSD. 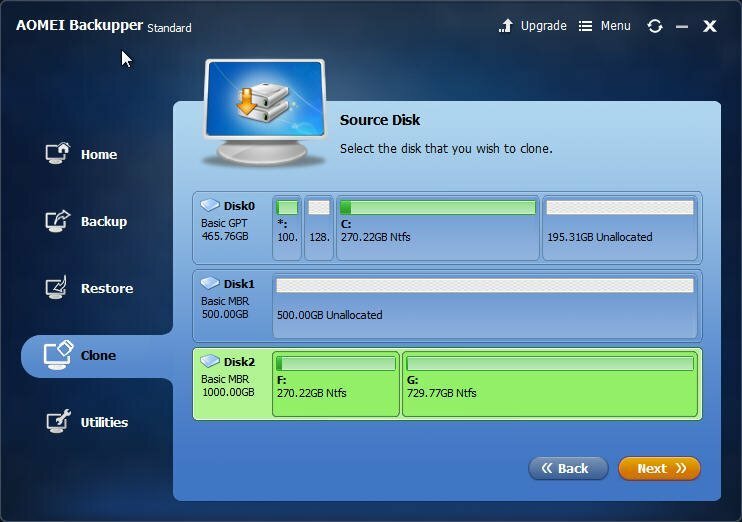 It’s gratifying that AOMEI Backupper Standard will help you to clone HDD to smaller SSD without any issues. 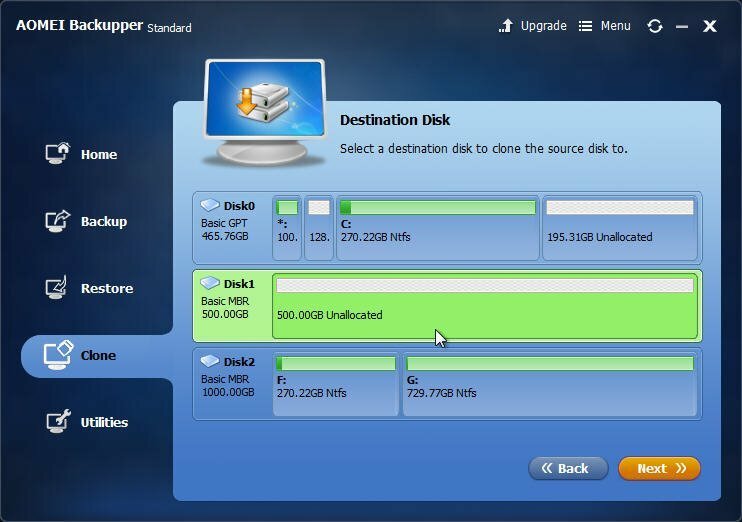 AOMEI Backupper Standard is the best free hard drive cloning software in Windows 7/8/10, which also applies to clone smaller HDD to larger SSD/HDD. It supports MBR/GPT disk, NTFS/FAT/EXT file system, and dynamic disk, hardware RAID, etc. This software also applies to Samsung SSDs, Toshiba OCZ SSDs, SanDisk SSDs, WD SSDs, Kinston SSDs, etc. 1. Install and launch AOMEI Backupper Standard. Select Clone, then choose Disk Clone. 2. Select 1TB HDD as source disk to clone. Click Next. 3. Choose 500GB SSD drive to save all the data on 1TB HDD. Press Next. 4. Press Start Clone if you have checked the Align partition to optimize for SSD option. 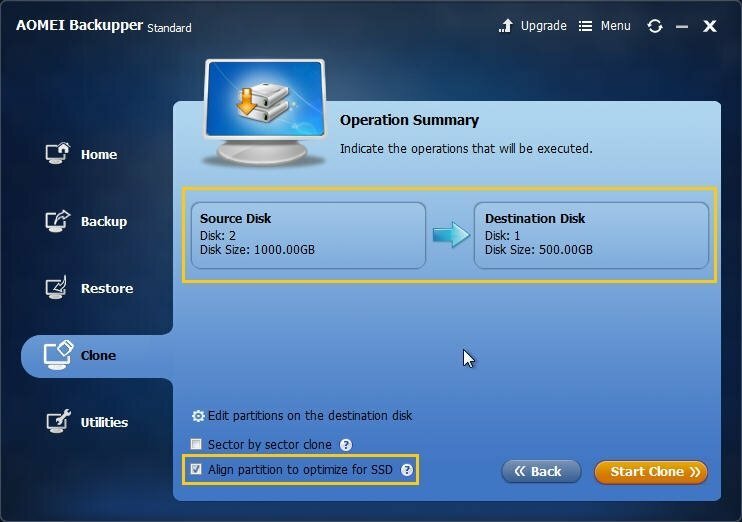 Tips: Make sure your destination disk is larger or equal to the source disk if you want to check the Sector by sector clone option. The cost time will rely on your data size on your 1TB HDD. After the operation of cloning 1TB HDD to 500GB SSD finished, shut down your computer, take out the 1TB hard drive, and put the 500GB SSD into the slot, restart your computer. Until now, everything is done. Furthermore, AOMEI Backupper provides the Professional edition to clone system, restore to different computer, merge backup images, real-time sync files, etc.